Morten Skaget skriver om sin tid i Hotlips: Blackmail (1980) This was actually a hobby-band, where we started to play heavy rock. We played a lot of AC/DC, and of course Whitesnake, Deep Purple etc..... The singer was in the beginning, a female singer named Toya, who's hair was coloured with a lot of colours. The drummer was Steinar, guitars Kjell Arne Brødreskift and Paul Simmons, and on keyboards Olav Norum. We also recorded a demo with 4 original songs. We participated.. Les mer.. This was actually a hobby-band, where we started to play heavy rock. We played a lot of AC/DC, and of course Whitesnake, Deep Purple etc..... The singer was in the beginning, a female singer named Toya, who's hair was coloured with a lot of colours. The drummer was Steinar, guitars Kjell Arne Brødreskift and Paul Simmons, and on keyboards Olav Norum. We also recorded a demo with 4 original songs. We participated in a local competition called 'Trøndersk mesterskap'. This was a competition in having the best rock band. WE WON!!!!!! The price, was to participate in the national championship in rock. By the time this championship was, we didn't have a complete band anymore. The singer had quit, and the other guys had gone and gotten jobs. 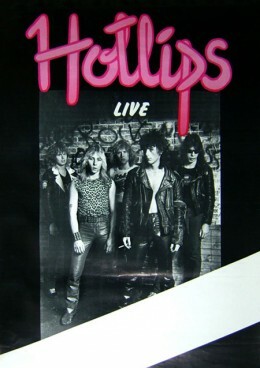 There was another band in Trondheim called Hotlips. In this band played among others Diesel Dahl on drums, 'Hottie' a local singer, Paul Simmons on guitar and Terje Storli (Stage Dolls) on bass. In order to participate in the final, we had to have at least three members from the original band . So the lineup in the final was Hottie on vocals, Diesel Dahl on drums, Roy 'Biba' Halvorsen on guitars and keyboards, Olav Norum on keyboards, Paul Simmons on guitars and me. WE WON THE FINAL AS THE BEST ROCK BAND IN NORWAY!!! !